Brian M. Sandroff from the Kessler Foundation and Robert W. Mot from the University of Illinois will present the results of a study on the effects of exercise in patients with multiple sclerosis (MS) today, Feb.18, at the Americas Committee for the Treatment and Research in Multiple Sclerosis (ACTRIMS) Forum 2016 in New Orleans. Exercise training represents a promising approach for managing cognitive impairment in patients with multiple sclerosis (MS). Preliminary evidence showed that treadmill walking might be the exercise that exerts the greatest beneficial effects on inhibitory control in fully-ambulatory patients with MS. The research team first compared the acute effects of light, moderate, and vigorous intensity treadmill walking (TMW) exercise on inhibitory control (IC) in 24 MS patients (study 1). The patients completed four experimental conditions (20 minutes of light, moderate, and vigorous intensity TMW exercise, and quiet rest) in a randomized, counterbalanced order. Using a modified flanker task, IC was assessed before and after each condition. Then, to assess whether an increase in core body temperature would have a negative impact on the potential benefits of TMW exercise on IC, the researchers examined the core body temperature during vigorous TMW exercise in 14 thermosensitive MS patients (study 2). The patients completed two experimental conditions (20 minutes of vigorous TMW exercise and 20 minutes of quiet rest). Using a modified flanker task, the researchers assessed the patient’s core body temperature throughout both conditions. IC was evaluated before and after each condition. In study 1, the results revealed that MS patients had an IC improvement in all three intensities of TMW exercise compared with quiet rest, and that the improvement was similar in magnitude. Results from study 2 showed improvements in IC for vigorous exercise compared with quiet rest, despite core body temperature being significantly elevated (approximately 0.6°C) after vigorous exercise in thermosensitive MS patients. 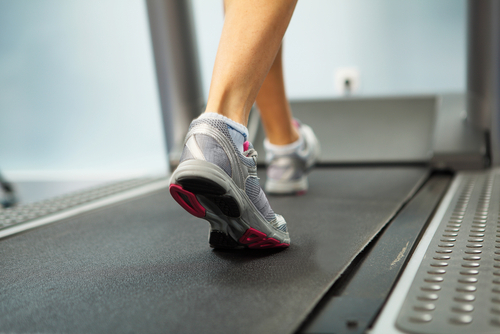 Based on the results, the researchers noted that light, moderate, and vigorous intensity treadmill walking might be beneficial for inhibitory control in MS patients. The findings also suggest that core body temperature does not seem to invalidate the beneficial effects of walking on a treadmill on IC in MS patients. “This represents the next step in delineating the optimal exercise stimuli for improving cognition in fully-ambulatory persons with MS, and supports the feasibility of chronic TMW exercise training for improving IC in thermosensitive persons with MS,” concluded the research team in their ACTRIMS’ abstract.